High-energy X-rays streaming from a rare and mighty pulsar (magenta), the brightest found to date, can be seen in this new image combining multi-wavelength data from three telescopes. 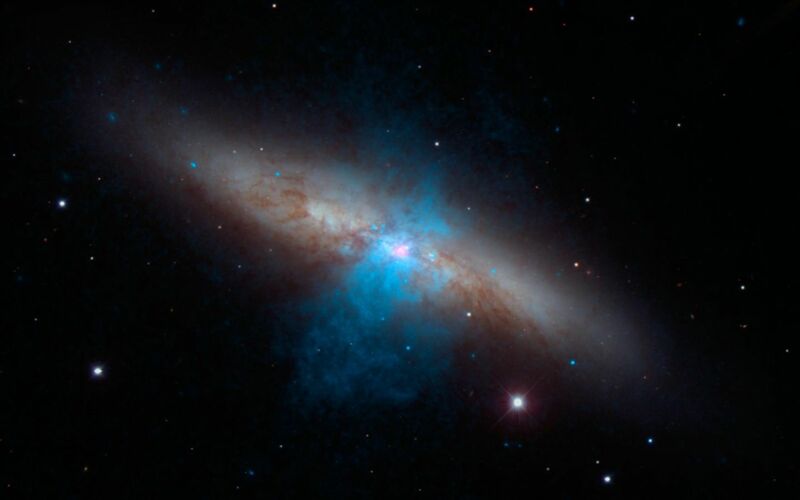 The bulk of a galaxy called Messier 82 (M82), or the "Cigar galaxy," is seen in visible-light data captured by the National Optical Astronomy Observatory's 2.1-meter telescope at Kitt Peak in Arizona. Starlight is white, and lanes of dust appear brown. 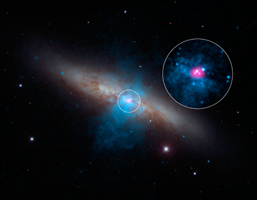 Low-energy X-ray data from NASA's Chandra X-ray Observatory are colored blue, and higher-energy X-ray data from NuSTAR are pink. The magenta object is what's known as an ultraluminous X-ray source, or ULX -- a source of blazing X-rays. Previously, all ULXs were suspected to be massive black holes up to a few hundred times the mass of the sun. But NuSTAR spotted a pulsing of X-rays from this ULX (called M82 X-2) - a telltale sign of a pulsar, not a black hole. A pulsar is a type a neutron star -- a stellar core left over from a supernova explosion -- that sends out rotating beams of high-energy radiation. 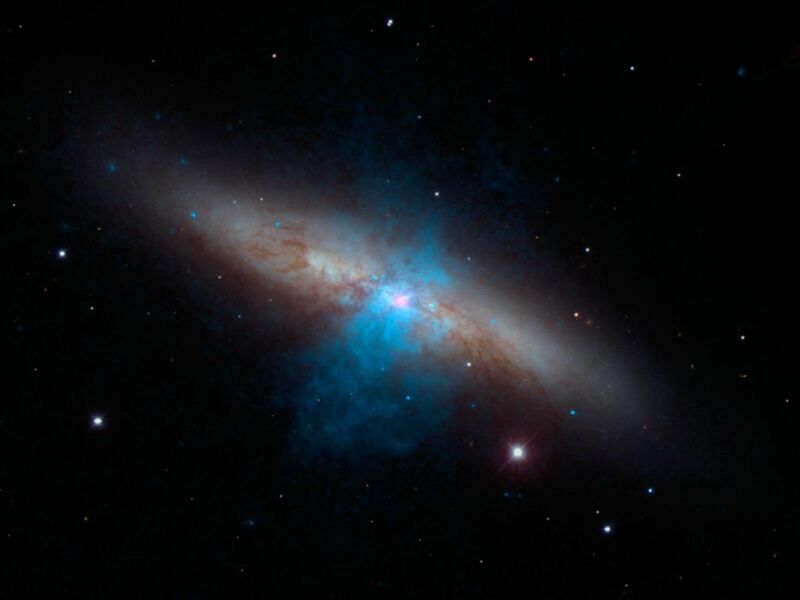 Scientists were surprised to find the pulsar at the root of the ULX because it shines with a luminosity that is more typical of heftier black holes. NuSTAR data covers the X-ray energy range of 10 to 40 kiloelectron volts (keV), and Chandra covers the range .1 to 10 keV. NuSTAR is a Small Explorer mission led by the California Institute of Technology in Pasadena and managed by NASA's Jet Propulsion Laboratory, also in Pasadena, for NASA's Science Mission Directorate in Washington. The spacecraft was built by Orbital Sciences Corporation, Dulles, Virginia. Its instrument was built by a consortium including Caltech; JPL; the University of California, Berkeley; Columbia University, New York; NASA's Goddard Space Flight Center, Greenbelt, Maryland; the Danish Technical University in Denmark; Lawrence Livermore National Laboratory, Livermore, California; ATK Aerospace Systems, Goleta, California, and with support from the Italian Space Agency (ASI) Science Data Center. NuSTAR's mission operations center is at UC Berkeley, with the ASI providing its equatorial ground station located at Malindi, Kenya. The mission's outreach program is based at Sonoma State University, Rohnert Park, California. NASA's Explorer Program is managed by Goddard. JPL is managed by Caltech for NASA.